When record snow caused the roof of the Delftree Mill to collapse it caused a chain reaction for WTF. Giuliano photos. 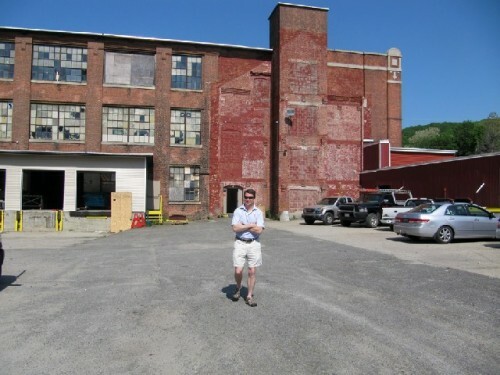 Joe Finnegan during a morning meeting at the Blackinton Mill in North Adams. A rear view of the Blackinton with three loaded WTF trailers. Finnegan had orchestrated the transition from the condemned Delftree to new quarters in the Blackinton Mill. Painting a floor off the welding studio. An empty space revealing the initial move in conditions. 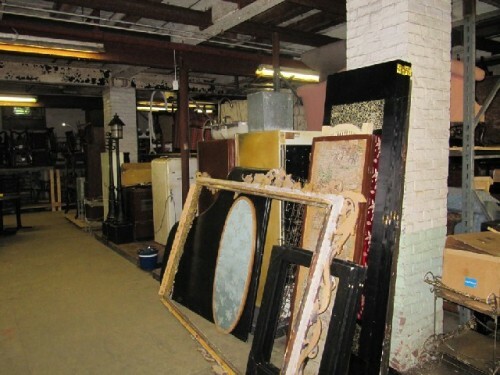 A basement of props and furniture. Suit cases for actors on the go. The collection was started 57 years ago. Dealing with an unforeseen and daunting challenge. The floor dedicated to painting drops. 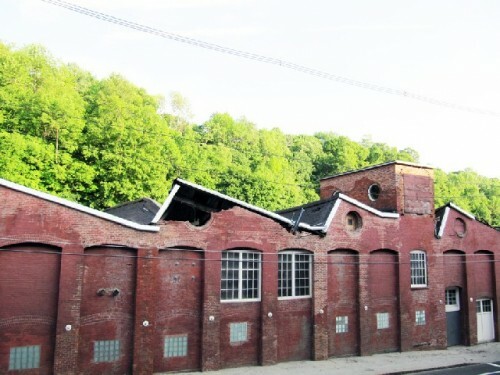 On February 11 Joe Finnegan of Williamstown Theatre Festival got word that the roof of the Delfttree Mill in North Adams had collapsed. 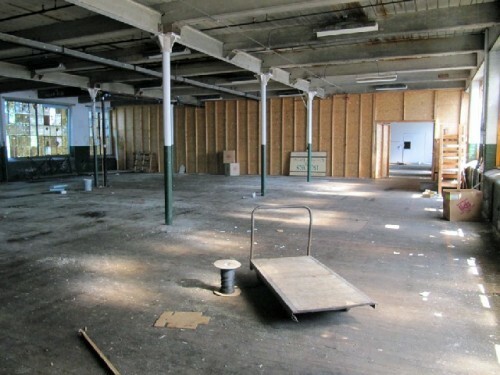 On its second floor in a vast space the mill housed the shops for building sets and storing props. After informing Jenny Gersten, the artistic director for WTF, who is about to launch her first season, and the Board, Finnegan felt there was lots of time to move out of the Defltree and set up a new facility. 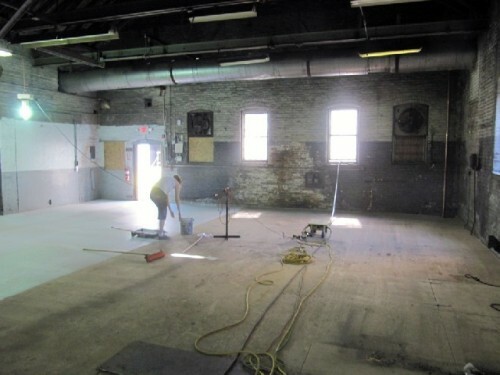 But the damage to the industrial space was so extensive that the building has been condemned. It would be weeks before there was sufficient structural support to allow for retrieving equipment and 57 years worth of props. The damage to which has been relatively minor. 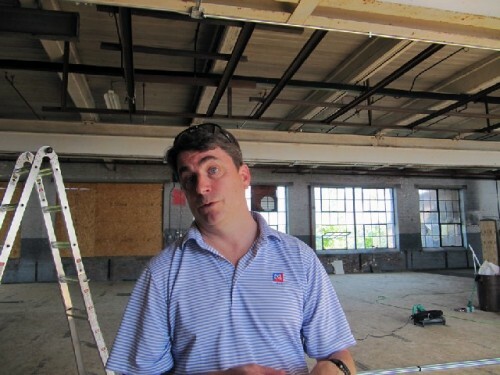 Today Finnegan walked us through the facility under construction in the Blackinton Mill in North Adams. 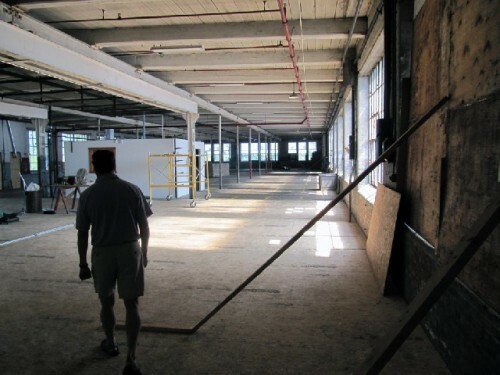 As always Finnegan seemed remarkably calm and on top of the many complications of building a facilty to build the sets. Joe Finnegan If you came here in March it didn’t look so hot. The owners are the Magid Brothers. We met with their building manager Dave Moresi. I met with him originally with Jeremiah Thies, our production manager, who is in charge of everything that goes on in here. He is the middle man between the scenic designers, who have a vision and then how are we going to take that vision and get it up on stage. The person who had done it for the past three years, Joel Krauss, resigned on February 1 to take a job in NY. 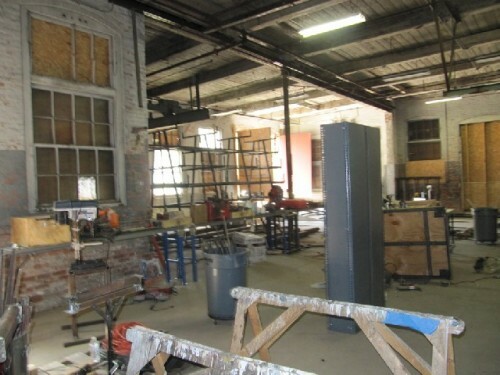 We didn’t know that on Feb. 11 we were going to lose our scene shop. Charles Giuliano We live in the Ecipse Mill across the street from the Delftree Mill and were shocked when the roof collapsed. But it was only last week when you e mailed me that I realized the full impact for WTF. JF Initially I thought that isn’t such a big deal as our season is not until… But when I went over on Monday, Feb. 15, I realized the building didn’t just have a hole in the roof. The whole building was condemned. The first time we were allowed to go in was March 18. For about 15 minutes. The building wasn’t safe. The owner Ariel Sutain had to shore up the structure. 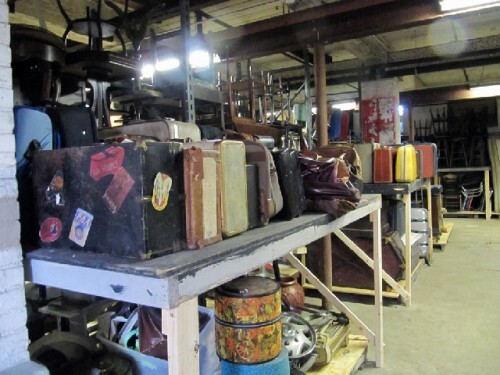 We had a lot of stuff stored there including ten vehicles. We have a fleet of vehicles we use every summer. We only use them for three months then we mothball them. Nothing gigantic but we move people, furniture and props around. We’re always moving stuff. On March 18 we got our vehicles and took them away. JF No and most of our stuff, say 90% was undamaged. I went in with an engineer and our time was pretty limited. 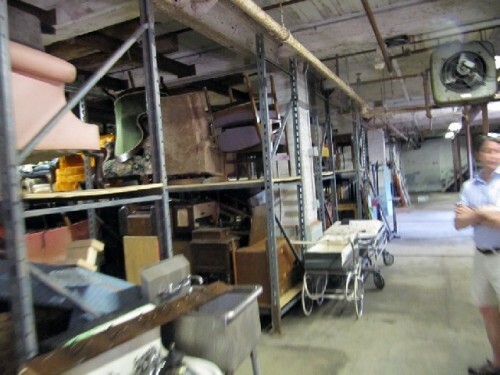 We were on the second floor and our scene shop was untouched by the collapse. You could see that water was coming in but all of our props looked good. But we couldn’t get back in there until May 5. We called Connors Brothers (movers) and it has taken three weeks to get out of there. 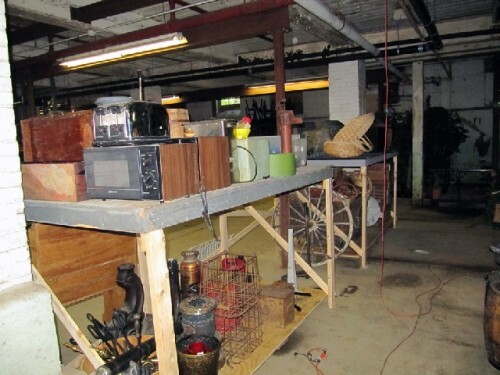 We have three trailers of stuff and I’m going to show you all the props we have in the basement. Two things happened on May 9. Connors Brothers went in there. This was an emergency. It’s the busiest time of year for them and they have done a phenomenal job. We went in with Jeremiah and he pointed out what he will need. I know nothing about a scene shop. I’ve been in a scene shop twice in my life. CG It’s been quite an education from Wall Street to Show Biz. JF They were able to take out all the big tools. As I am about to show you and they have been moving out everything else ever since. CG How far behind schedule are you? When would you normally start to build sets? CG So you’re not technically behind schedule yet? 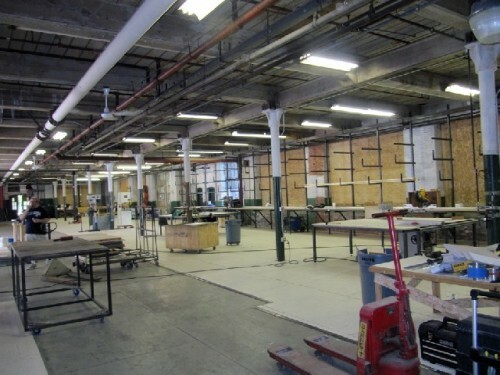 JF All of the guys that you see here now were hired to get the scene shop up and running. It started May 9. That week we had ten guys. This week we might have 15. CG This is an unanticipated expense so where is the money coming from? JF We are hoping the insurance company will cover the loss of use of space. CG Insurance adjustments take time. JF They do but we have no choice. CG Did you tap into reserve funds? JF We haven’t yet. We have a fairly solid capital base. CG You have an endowment. May I asked how much it is? JF No. You ask me every time. CG Why don’t you just save me the trouble? You always give me a hard time. (Both laugh) Then you complain when I report. CG Somebody does. Give me a personal thumbnail. The roof falls in, literally, then you call Jenny (Gersten) and say “Guess what.” So what happens after that? Run me through the process. JF I contacted Jenny and the Board. But there wasn’t much you could do at that point because there was so much that was unknown. CG This is Jenny’s first season. She’s got a lot on her plate and then a major catastrophe occurs. JF I hope that I helped her to stay focused on her season and I focused on this. Jeremiah was a huge help. He had been hired but was still working in New York and was shuttling up here. We knew we had the problem when we were hiring him. It became a part of the job but I don’t think anyone realizes how big a deal it is until you do it. There are three trailers still parked out there. 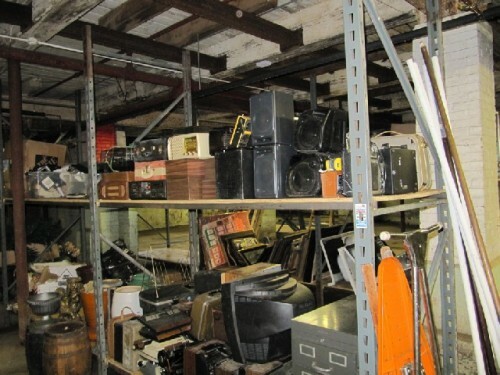 I’m going to show you 57 years of props in the basement. You’ll see all the wracking that we built and the flooring. It’s phenomenal and you’re talking about just three weeks. We’re here for five years. We hope we like it here and that the landlord likes us. JF Solid. I haven’t been up there but Jeremiah has. In a perfect world you would never try to pull this off. I wasn’t as nervous in February as I was when the end of March rolled around. What if we didn’t get into the building until June 15. The space itself is impossible to recreate. We had three bays next to each other that were 200 x 30.’ They had to walk a half a mile to get to the loading dock with sets. There are things that are better and worse. But the question is where are you going to find real estate like that? You’re not. The closest to Delftree was the former Chevy dealership in North Adams. They had a building in front and one in the back. One of their roofs was totally compromised and that had to come down. That was another option. We thought about a lot of options including what if we don’t build any sets this summer? I mean not build them ourselves but shopped it out. CG You could have gone the avant-garde bare pipe approach. JF Do you think the people who have been coming to the theatre festival for 50 years would be happy with that? CG We saw a production of Medea in London by the Abbey Players with Fiona Shaw on a bare stage with props. It was stunning and memorable. So it can be done. What has been the response of the scenic designers? JF I’m not sure they know. Jeremiah has been talking to them not about our problems but how do we get the set they are designing onto our stage. CG Many of the sets have been amazing even on the smaller Nikos stage. The one for Theresa Rebeck’s The Understudy was astonishing. JF I agree. I saw it in NY it was the same set with just a little more money and the ability to make it bigger. In our schedule each set, max, gets three weeks. We’re going to start building Streetcar this week. It opens on June 22. We have to load that in on the 18th and 19th. That’s two and a half weeks. We build seven of them. We have to load Three Hotels the following weekend. CG What do you know about all this? JF (Laughs) I’m just learning. You learn a ton. Jenny has brought together a great team. CG In addition to WTF you are also on the Board of the Williamstown Film Festival. Prior to moving here you were on Wall Street. Now all this theatre and film. Was it a midlife crisis? JF (Laughs) I’ll have to check with my wife. Honestly Charles when I came up here I didn’t even know there was a Williamstown Theatre Festival. Or film festival. I met Steve Lawson. He grew up in the same town that I did. I love film and theatre. 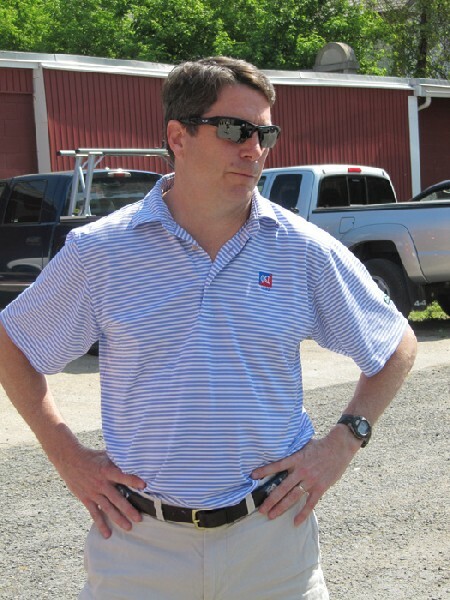 CG We are embedded in such world class talent here in the Berkshires and Williamstown. Why is that? JF From May first through the end of November there is no more beautiful place in the world. You’re three hours from Boston and three hours from New York. Forty Five minutes from Albany. Great Barrington and Lenox benefit from being just two hours from NY. CG It’s tougher to get people to come to Williamstown. JF You have to go with the field of dreams if you build it they will come. When we got to the second week of Forum last year people were coming from Boston and Great Barrington. It’s there on the stage and Jenny has put an incredible first season together. The plays she’s chosen, the people who are working with her, the designers, the directors, the actors, across the board. CG So you are sanguine about the season. JF Define sanguine. We can go through the brochure together. CG I’m still not seeing a lot of marketing out there. JF We will show up. Our box office is open tomorrow. CG It still comes down to boots on the ground in mid June. We’ve been talking for the past couple of years about having more of a year round presence. To get the marketing out faster. JF We do what we can with what we got. Our staff starts showing up at the end of this week. We have a marketing plan in which you are going to see us everywhere. For print media we have the Albany Times Union and the Berkshire Eagle. On the internet we have ads on your site and Rural Intelligence, Seth Rogovoy, We are doing a website. We’ve traded aggressively for ad swaps with the Colonial and others. The ad dollars are leveraged to the best of our ability. CG This unanticipated disaster can we put a figure on it? JF Between $250,000 and $300,000. We are hoping insurance will cover what was totally out of our control like the loss of business. The annual budget is $3.1 or 3.2 million. CG Compared to the overall budget that’s not such a huge percentage. JF But it’s a huge unanticipated expense. More than the money it’s the issue of getting it done. CG Shall we take a look? CG How does this space compare to what you had. It seems pretty terrific. JF The natural light is lovely. The windows aren’t perfect be we can work on that. Scrape some of the paint off the windows. If the landlord gets enough tenants they will fix the windows. It’s a huge expense. CG Is this as good as what you had before? JF Because of those three bays we couldn’t find anything like that. We looked at the Pownal Racetrack as well which is a huge space. CG In essence you are not only building the sets but building the space to build the sets. What is the degree of difficulty of that? JF You would have to ask Jeremiah. To me these guys have been killing it. When I walked in here I didn’t have the vision for this. Jeremiah has designed this space. CG How many interns will be working here? JF I’m not sure I’m thinking its 30 but the full interns arrive on June 15. These guys you see here are building the shop then there are the guys who arrive and will be building the sets. In a normal year we would be here from June 15 until the end of September and then shut it down. When you think of the magnitude of the work we do in the summer we can’t just turn it back on. If the last show is August 28 we need a week to take all of our management stuff from the college. It comes back here. It’s class room space to the college but office space to us. All of that comes back, gets stored, and then we’re done. CG In terms of degree of difficulty what is the difference between an ambitious summer program and running year round? JF Twelve months you have a totally different budget. For eight and a half months we are a staff of ten to twelve. Come June 15 its huge. Then to shrink that down to one show would be interesting but how would we do that? We don’t just put on shows. There’s an educational component. Kids are coming here to learn. David Kornis is back. He was here last summer for Our Town. This summer he’s doing She Stoops to Conquer. Nicky loves working with him. CG Alexander Dodge? He did Forum last year. JF He’s been here a lot but he’s not doing anything this year. What happens is that when you pick the director they bring the people they trust. There’s not a lot of time and you have to get it right. (Walking to the basement) Here you are going to find any prop you ever loved. 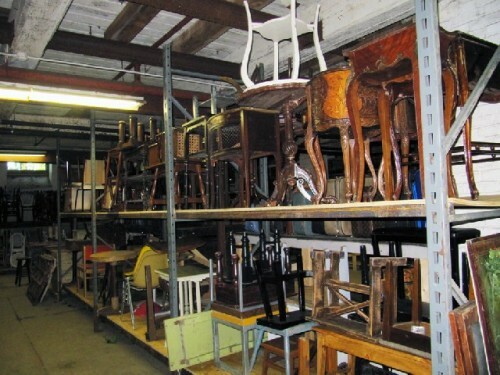 Here you’re looking at 57 years of furniture and props. JF The Costumes are over at the college. Ten days ago there was nothing in this room Just racks. There is much more to come. Let’s go up two floors. This is our paint deck where we can lay out a big backdrop and paint it and give it a couple of days to dry then roll it up or fold it. This space is specifically to paint drops and allow them to dry. It’s beautiful natural light. I’m surprised that nobody ever talked to you about the time line. Streetcar is going in on June 22 which means they tech on June 20 and 21. So it has to go in on the 18th and 19th. That show closes on July 3 a two O’Clock show on Sunday which means that it ends at 5 and the audience is out by 5:30. At 5:30 they rip that set out and put in the set for One Slight Hitch. The first tech rehearsal is Monday night. They have 24 hours. That set will be up for two weeks and then they will rip it out and put in the next one. That will be there for two weeks and then we’ll do it again. CG For seasonal summer theatre you do productions of Broadway quality. JF Exactly which is why this has been so problematic. If you are going to have a roof collapse it’s much better to have it happen in September. The question was what are you going to do about it. The answer was go find the space you need and make it happen. CG How many square feet are you occupying? JF The first floor is 14,000, 6,000 here and 5,000 down below, 6,000 over there so all told about 31,000 square feet. CG Compared to how many at the Delftree? JF It was configured differently and this is slightly smaller. Our space for props has taken the biggest hit. In terms of what our options were we felt this was the best choice. The landlord has done a lot. All of the strobe lights and fire alarms were not here. The mayor, building inspector and fire chief of North Adams understood that if we didn’t get a temporary Certificate of Occupancy by this week we can’t build sets. Everybody got it. Think of how much money we’re spending here. We bought all this wood locally. We put money into the economy. All these guys are staying at the Williamstown Motel. He cut me a great rate. They’re all eating somewhere three meals. Then think of what people who come to see our shows spend on hotels and restaurants.